On Thursday night, we went to the MTES offices and made about 300 packages of food, which consisted of two slices of pizza and two breadsticks, and packed them into two large coolers. We took the coolers, along with cases of soda, and loaded them into the back of Jon’s pickup truck. Outside the office, we were greeted by about 20 people who knew to expect us. For the past seven years, MTES has been distributing food every Thursday night to people living on the streets in San Salvador. MTES uses this ministry as a chance to spread the word about their other programs, such as El Faro (described in our last blog post) and New Dawn (a nine to 12 month residential drug rehab program for minors). Our team hopped in the back of the pickup truck, the people formed an orderly line behind the truck, and we handed out the food and drinks to them. Then Ronnie, an employee at MTES, jumped onto the back of the truck and we began our night driving through the city, finding more homeless people, and distributing food and drinks. When we would find a group of people, Ronnie would shout, “Comida!”, which means “food” in Spanish. It was apparent how important this ministry was for the people living on the street and you could see the excitement in their eyes just to receive a small meal. On Friday morning, we had the opportunity to see one of the young men graduate from the New Dawn program. He had entered the program about one year ago addicted to drugs. During his time in New Dawn, he received drug rehab services, counseling, tutoring, and more. His graduation was attended by not only his family but the families of the three other boys who are currently in the program. When it was time for the young man to say a few words, he broke down into tears because he was so grateful for the way his life has been changed over the past year. The other boys in the program stood up and surrounded him to give him support as he tried to speak about his gratefulness. Friends and family members were also overcome with emotion and joy seeing how far he had come in such a short time. The boys all then performed a song they had created during their time in the New Dawn program. After everyone had left and we ate a brief lunch, we hopped back into our work projects that we had started the day before. 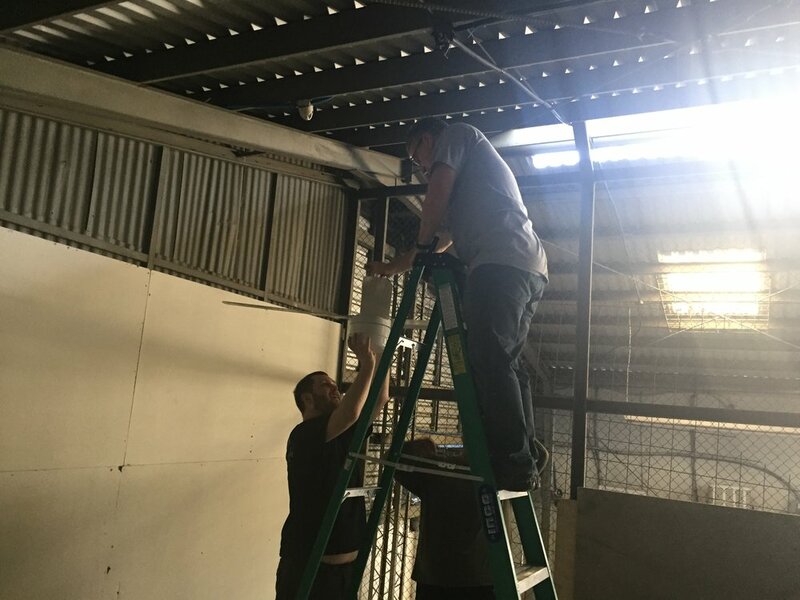 Paul and Sean finished wiring and hanging the ceiling fans and everyone cheered when we flipped the switch and the fans turned on! Yay! Jim and Eric finished hanging the sheetrock wall, and Rachel continued painting the offices with the help of Jon and Danielle’s son Ian. On Saturday morning, we went back to the MTES office and hung out with the three kids still in the New Dawn program. We played soccer for two hours in a small indoor court that a previous missions team constructed inside the garage area. We had a lot of fun and enjoyed seeing these kids who are going through a lot in their lives having time to just laugh and run and get some energy out. For lunch, we grilled hamburgers and served them to the kids. A few of us even were bold enough to add some hot peppers on our burgers! That evening, we attended a church service that is held inside the MTES offices but is run by an organization called Hungry Church. The church was founded by and reaches out to ex-gang members who were deported from the US to El Salvador as well as other deportees from the US. Before church began, they ate a meal together and enjoyed each other's company. The pastor spoke in English and it was translated into Spanish by one of the founding members so that the service would be accessible to everyone. At the end of the service, some of the members stood up and gave their testimonies. Most of them were brought to the US at a very early age and grew up speaking English and going to school. They then fell into the gang lifestyle or were just caught up with the wrong crowd, were arrested and spent time in jail. After serving their time, they were deported back to El Salvador. Some of them had absolutely no family or other connections here. One of the newest members spoke to us about how his family had taken him to the US when he was just 4 years old and had just been deported to El Salvador after being there 37 years. He told us about the culture shock because while he was born in El Salvador, the U.S. is his home. He spoke about God’s provision in that he was able to be connected to Hungry Church and in the two months time he has been in El Salvador they were able to get him into a housing situation and he was able to be setup with a job as well. It was amazing to hear the stories and talk to the members of the church, which was started out of a hunger to read and understand the Bible and a desire to reach out to the “unwanted” and “misfits” of the city. 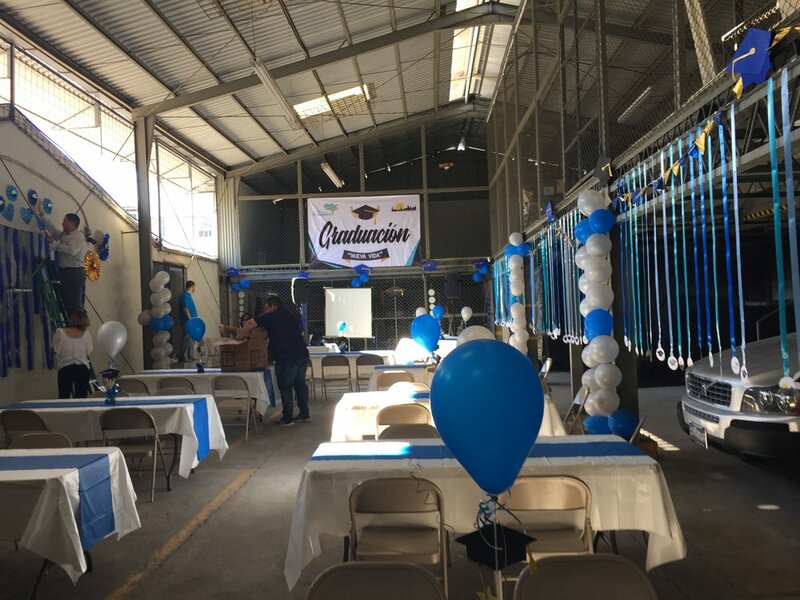 The garage at the MTES offices decorated for the New Dawn graduation ceremony. Eric drilling in the final screws for the sheetrock. Above you can see the two fans that Paul and Sean hung. Sitting in the back of Jon's pickup truck, before going to the MTES offices on Thursday night to package and hand out meals. Paul and Sean hanging a ceiling fan. 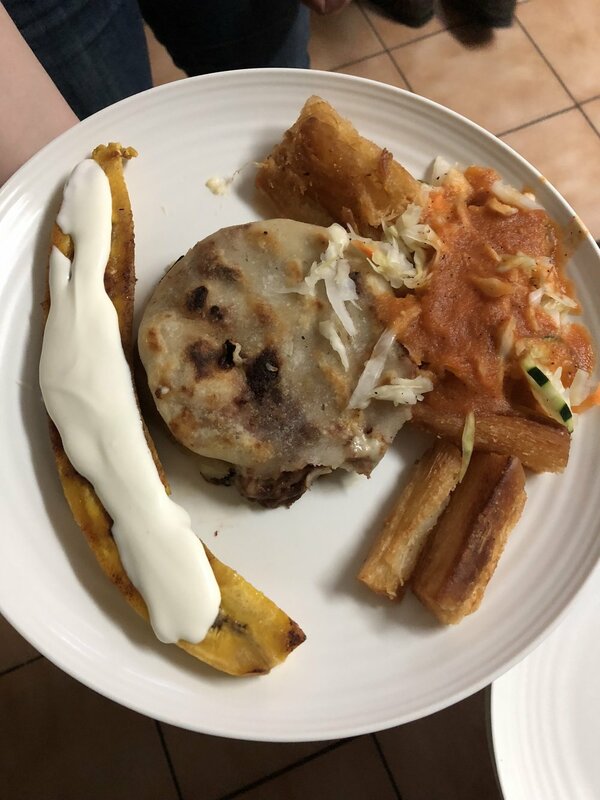 Pupusas are a traditional food in El Salvador and the team had the chance to each them on Thursday night, along with yuca, plantains, and curtido.